A man way ahead his time, Masanobu Fukuoka wrote "The One Straw Revolution" in 1975; his book has been translated into over 20 languages and sold more than one million copies. 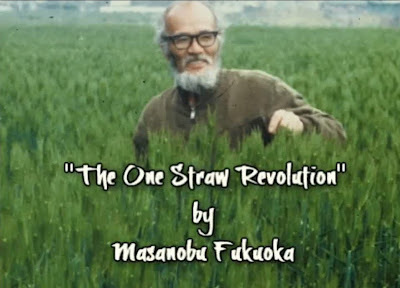 From just this one straw ... a Revolution could begin. there can be neither natural farming nor natural food. they spin further and further from the Centre. it is the cultivation and perfection of human beings. An understanding of Nature lies beyond the reach of human intelligence. Permaculture seeds balls, Fukuoka style. Keywords to continue your own research: “permaculture”, “seed balls”, “Natural farming”, "Do-Nothing Farming", "Guerilla gardening"